Gaming laptops aren’t exactly known for their portability and battery life but those are precisely the two areas Gigabyte has elected to focus on with its latest ultraportable, the Aero 14. Unveiled earlier today at Computex 2016, the Aero 14 packs a 14-inch QHD (2,560 x 1,440) IPS anti-glare display that’s powered by a sixth-generation Intel Core i7-6700HQ Skylake processor (2.6GHz default, boost up to 3.5GHz) alongside an Nvidia GeForce GTX 970M with 3GB of GDDR5 and up to 32GB of DDR4 2133 RAM. The machine can accommodate two M.2 solid state drives (PCIe Gen3 x4) with speeds of up to 2,000MB/sec. Other specs include a USB 3.1 Type-C connector, three UBS 3.0 connectors, a headphone jack, SD card reader, HDMI 2.0 and miniDisplayPort connectors, 802.11a/b/g/n/ac Wi-Fi, Bluetooth 4.1 LE as well as a sizable 94.24Wh battery which Gigabyte claims is good for up to 10 hours of use on a single charge. All things considered, the system measures 335mm (W) x 250mm (D) x 19.9mm (H) and tips the scales at 1.89 kilograms, or just under 4.2 pounds. 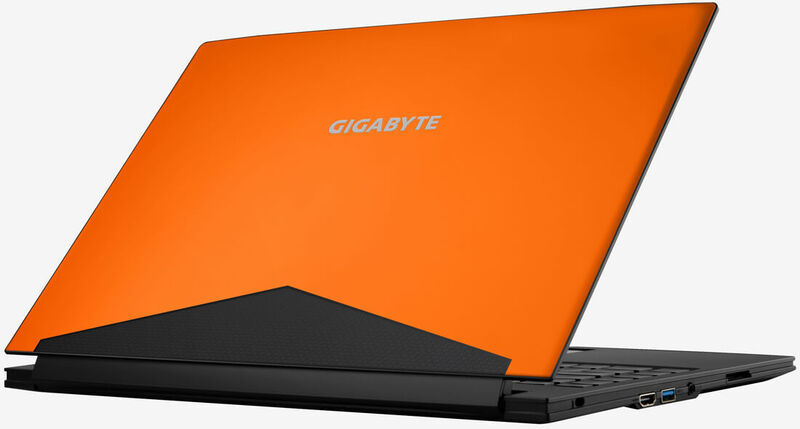 The Gigabyte Aero 14 will be offered in three colors: black, green and orange. No word yet on how much Gigabyte plans to charge for the opportunity or when it’ll be available to purchase. Those in Taipei for Computex are invited to swing by Gigabyte’s booth to check out the Aero 14 in person.